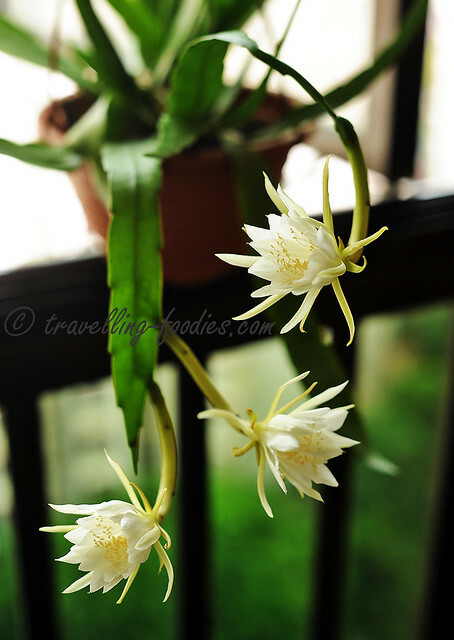 Interestingly, those blooms didn’t close at dawn, remaining opened all the way till almost noon. Must have been the cool and humid weather that day that impeded the transpiration. Alas I didn’t use those blooms then for it was a new pot and I’m not gonna take any chances on feeding myself any residual pesticides and whatnots on the leaves and flowers. So patiently I waited, for them to bloom again and blimey, they most certainly did, and in just a short span of less than 3 months from the previous. But me ain’t complaining … pretty sure that the plant is completely “organic” now as I’d not added anything to the pot except to water, and a small teaspoon of slow release organic fertiliser directly to the soil. 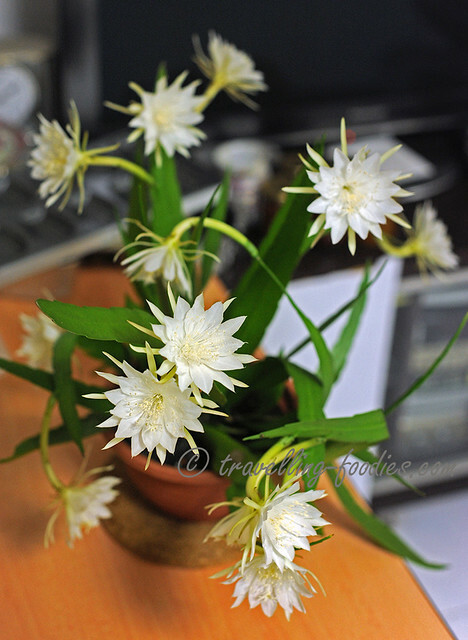 So these blooms are definitely safe to eat. Yeah! 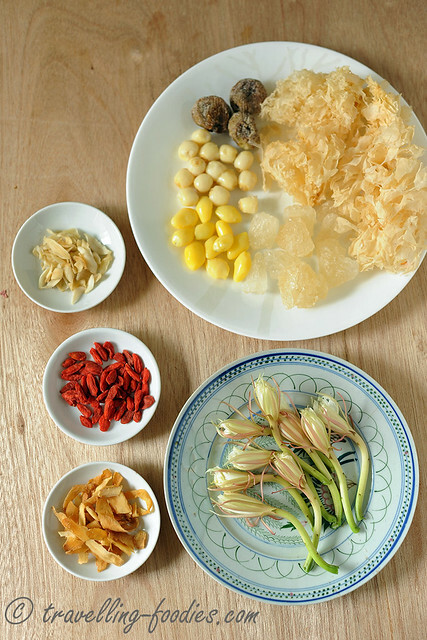 The ingredients are very much “everyday TCM” kinda fare, easily available from even the local supermarkets and doesn’t require a prescription from a proper sinseh. They are nonetheless very effective to bring about positive attributes that help reinforce and strengthen our constitution in one way or another. 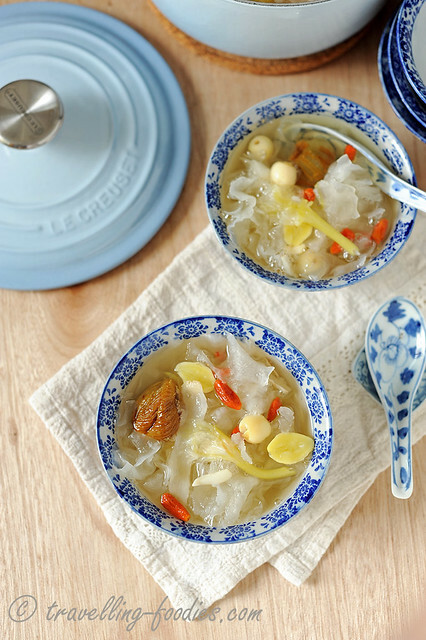 White fungus (银耳) for example, is often described as a poor man’s bird nest, bearing similar properties to the much-coveted tonic but at only a fraction of the cost. It is good for maintaining our complexion and thus one should really eat more! The fibre from the fungus is an excellent source of roughage to aid in peristaltic action in our digestive tract, especially good for folks who have problems with constipation! Gingko nuts (银杏/白果） is well known for brain power boosting while Solomon’s seal (玉竹) is good for its restorative properties and thus commonly used as a base ingredient in many traditional Chinese herbal soups. Goji berries aka wolfberries (枸杞) is good for the eyes while lily’s bud (百合) for fortifying the “qi” in our body. Then comes the keng huay flowers, which is good for curbing cough，clearing our lungs and respiratory passage, which is exactly what I need now! That said, keng huay is entirely optional in this recipe. It is a good to have but not a must have because the effects which the other ingredients can bring about a very good soup already! To fully capitalise on the medicinal effects which the ingredients provide, the choice of cooking ware can be important. Generally anything which is eaten for their medicinal properties should not be cooked with a metal pot, be it aluminum or stainless steel. These are thought to lessen or even nullify the goodness which the herbs can bring which would render their consumption futile. Traditionally, ceramic ware be it porcelain or earthen are used but I’m accustomed to use my Le Creuset cast iron french ovens for the task of soup brewing. The sand enamel coating is completely inert and thus would not interfere with the cooking process in any way. Thermal conductivity of the material is excellent to allow the soup to simmer under very low heat, yet maintaining very uniform thermal conduction throughout. That said, the heat can be maintained so low, the circulating convection currents are as gentle as they can be, keeping the ingredients intact and the broth clear and pristine looking. I would say the effects are almost like the traditional Chinese cooking practice of double-boiling! But no more rattling of the fragile porcelain double steamer sitting in a pot of water which we are so accustomed to “hear” at home many many moons ago. 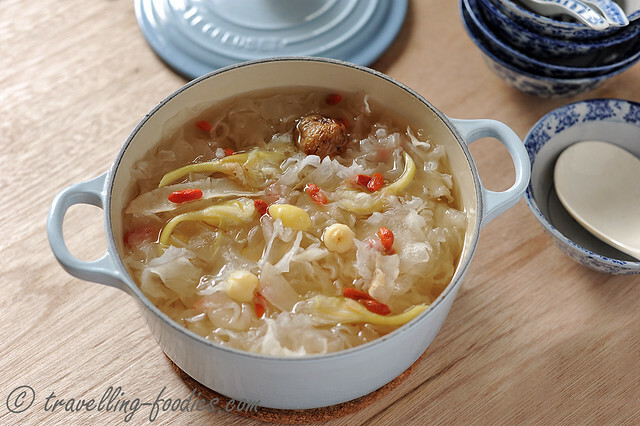 Briefly soak white fungus in water at room temperature just to soften the brackets. Rinse thoroughly to remove any dirt or debris and trim away the harder bits. 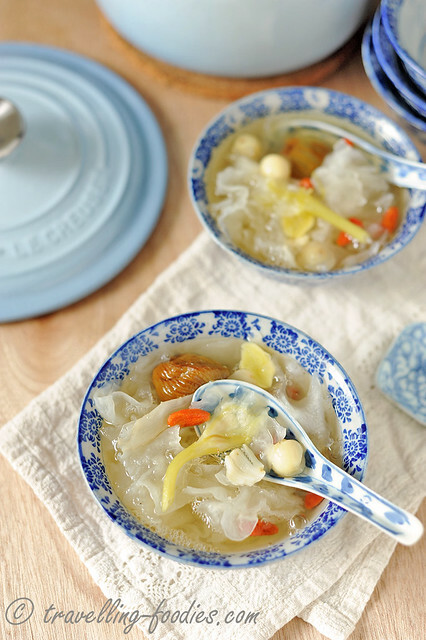 Do not soak the white fungus over prolonged periods of time. Cut to break the slightly reconstituted white fungus into bite size pieces. Halve the gingko nuts and remove the green shoot in the middle. Do likewise for dry lotus seeds. 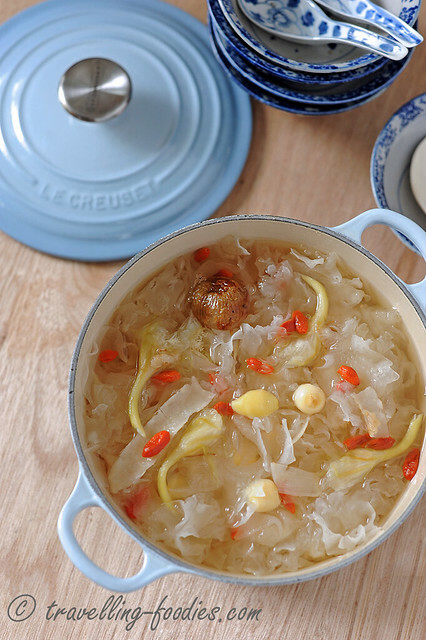 Place reconstituted white fungus, halved gingko nuts, honey dates, lily bud, Solomon’s seal and rock sugar in a pot with water and bring to a boil. When the water is boiling in the pot, rinse the dry lotus seeds very quickly and add into the pot immediately. Lower flame down to a bare simmer, add half of the keng huay blossoms at this point, cover with lid and continue to cook for 20-30 min or until the lotus seeds have JUST soften. Add goji berries and remaining keng huay into the pot, give everything a good stir, cover with lid and turn off flame. Leave the ingredients to steep for another 30 min. The sweet broth is now ready for consumption. To enjoy cold, leave the pot to cool down to room temperature before placing in the fridge for a couple of hours. And don’t forget the free cookbook giveaway which is happening now until 7th November! Details in the link below! This entry was posted on November 4, 2016 by Alan (travellingfoodies). 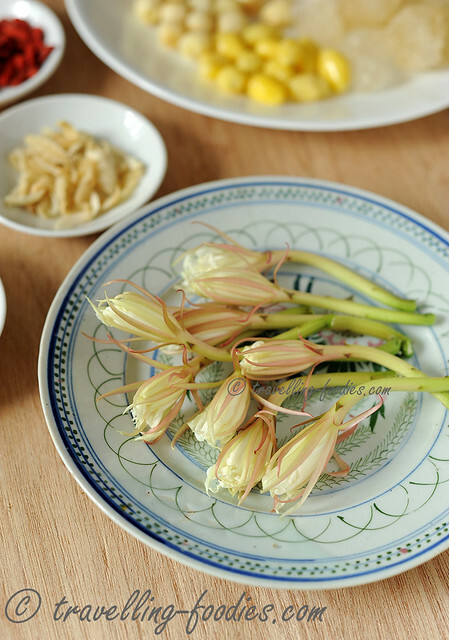 It was filed under Food, Simple Eats and was tagged with chinese herbs, chinese medicinal, epiphyllum, gingko nuts, goji berries, honey dates, keng hua, keng kwa, kheng kua, lily bud, lotus seeds, night blooming cacti, solomon's seal, succulent, white fungus. Thanks Alan, for bringing back nostalgic recipes and memories to me. My Nanny used to make it and how I LOVED the chilled version! May sound odd but she added boiled quail eggs and winter melon sugar thingie. Hahaha!!! She used charcoal and a special looking enamel pot. Once I can get hold of the ingredients here in Paris, I shall give it a go!